I have what some might call a morbid fascination with cemeteries. And prisons. I often wonder if I somehow see the two related. While others wander through the art galleries and museums of this world, I spend my time in graveyards reading epitaphs wondering about the lives of those who’ve gone before me and those they’ve left behind. Dean Martin’s tombstone reads: Everybody loves somebody sometime. Bette Davis’s: She did it the hard way. But my favourite has to be Spike Milligan’s: Dúirt mé leat go raibh mé breoite (I told you I was ill). Way back in the good old days of the Wild West, when death was completely random and a sense of humour prevailed to the last, some classic epitaphs can still be found. Lawyer John E. Goembel: The defense rests. Auctioneer Jedediah Goodwin : Going, going, gone. I’ve often wondered at a particular choice of gravestone and have given some consideration to what I’d like mine to be and what I’d like it to say – if I’m not cremated. I’m undecided. It was in Macugnaga, in the Italian Alps, that I first saw a photograph encased in glass on a gravestone. I thought it rather strange that someone would want their photo displayed, but as I walked around the small cemetery, the idea grew on me. It was like visiting a place where people, though dead, were still very much alive in spirit…you could put a face to the bones buried beneath. 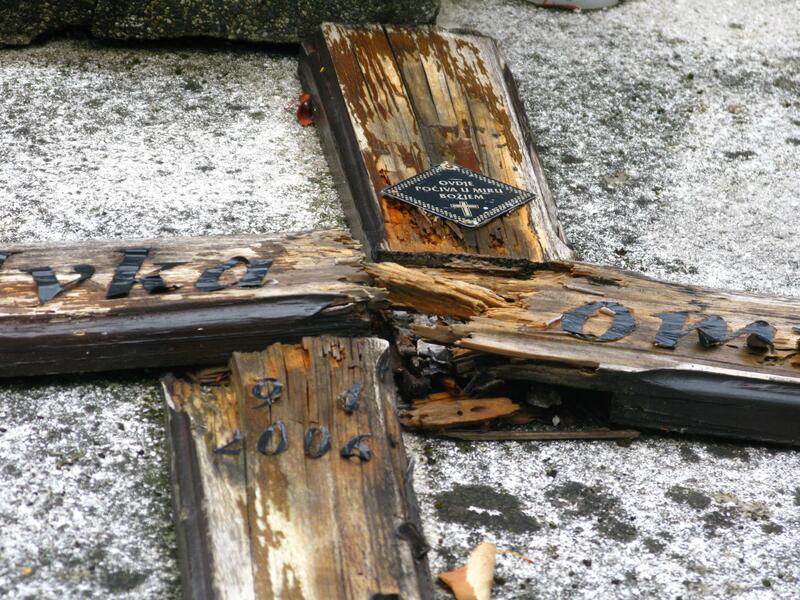 In Warsaw some years later, in the Jewish cemetery on Okopowa Street, I was struck by the notion of adding a person’s occupation the gravestone – but is this so strange? In life, some of us become our profession and lose sight of who we are as people, so why not carry this identity with us and go the grave proclaiming what we were. In a Russian Orthodox graveyard in Eklutna, Alaska, each grave has a spirit house, built as a new home for the soul of the deceased. In Manchester, UK, some Irish traveller families have erected huge, gigantic marble monstrosities that seem be in some strange posthumous competition with each other – keeping up with the Joneses well after all the Joneses are dead. 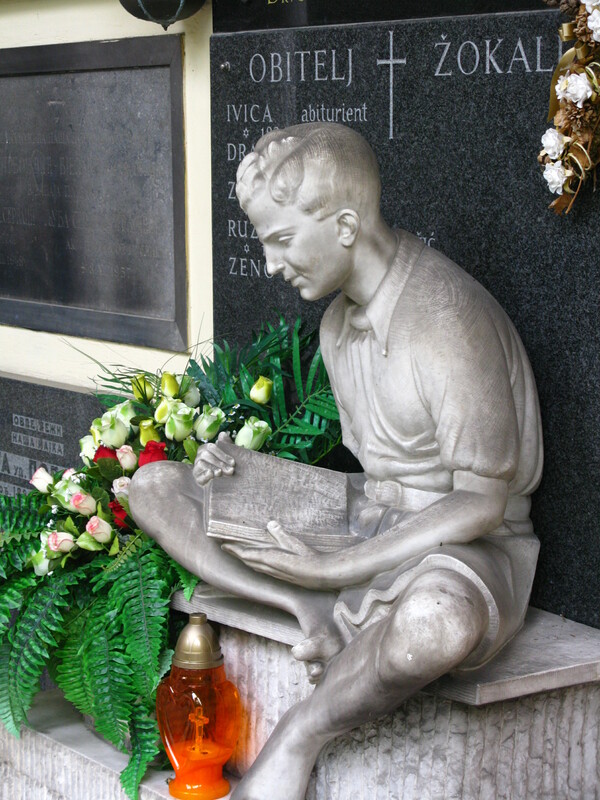 Until a recent visit to Zagreb, I’d never been to a non-denominational cemetery – or at least, I am not aware of ever having been in one. 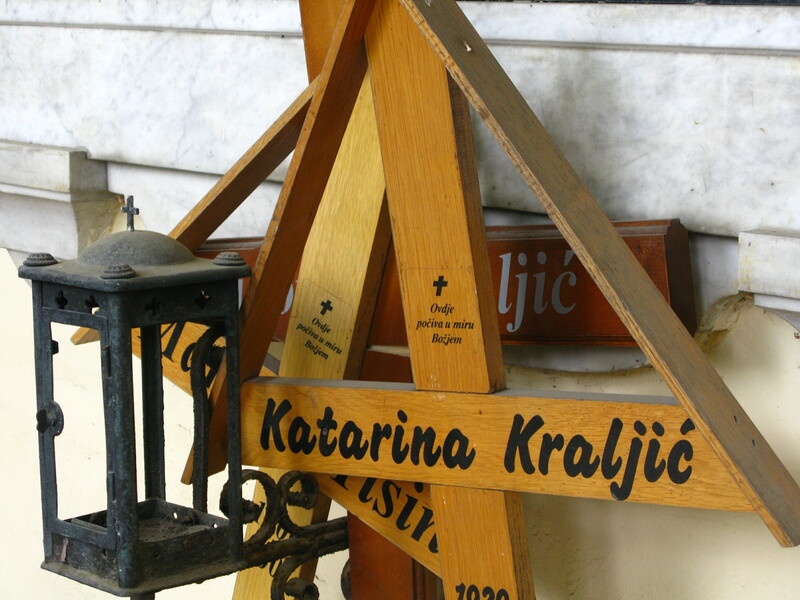 The cemeteries with which I am familiar tend to be strictly segregated – Catholic, Protestant, Jewish, Russian Orthodox. The idea of mixing religions in death strikes me as ironic considering the trouble various religions have living side by side. 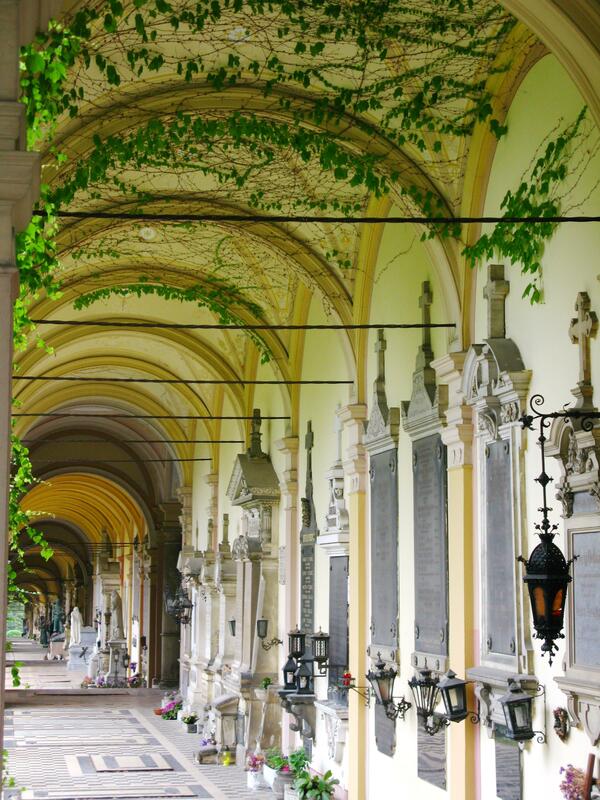 Mirogoj cemetry has been very much inclusive since it first opened its gates in 1876. The work of Hermann Bollé, it’s a beautiful spot, with a series of ivy-clad cupola’d arcades running along the inside walls. It’s home to Jews, Muslims, Orthodox Christians, Catholics, communist Partisans and the German dead from WW2. Crescent moons, Jewish stars, and RC crosses adorn the gravestones. Rows and rows of grave-lined paths diverge from the main gate. There’s a computer kiosk where you can key in the name of the person you are looking for and it’ll tell you where go to. Without this, it would be practically impossible, or, take days to find it for yourself. A couple of years go, on Achill Island off the west coast of Ireland, I visited a famine graveyard. Simple, overgrown, and wild, it was a stark reminder of an Ireland that is in danger of being forgotten. A story book of life and death, a living testimonyof times gone by. In South Africa earlier this year, I stumbled across a cemetry from the Boer War. I’d never realised how many nations were involved in this particular fight. But it too, like the famine, seems so very long ago. Mirogoj cemetery is different. 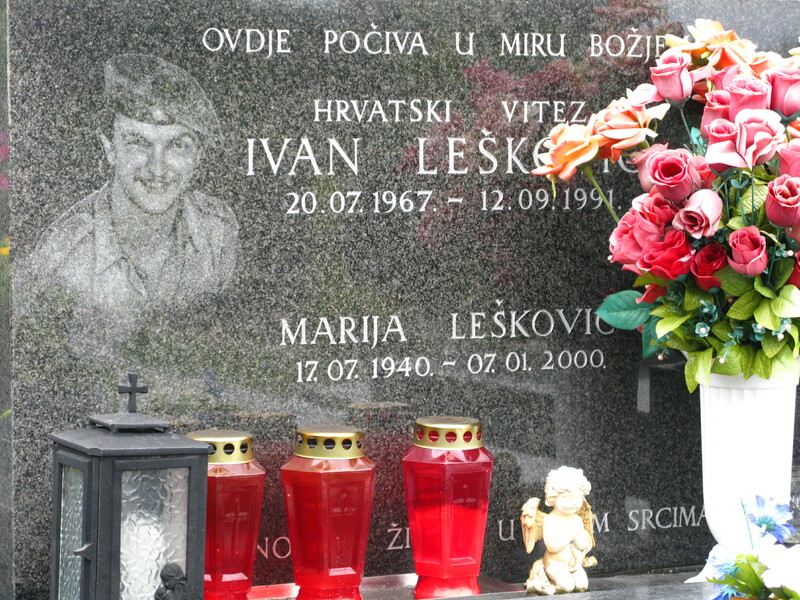 It is home to row after row of men my age who died in the Yugoslav wars. My age. My age. In another life they might have been my brother, my husband, my best friend. And while they were dying for the promise of a better tomorrow, I was living in Alaska, in my own little world, completely unaware of what was going on Europe. We speak of living in a global village but in truth, we are worlds apart. Einstein nailed it when he said: the more I learn, the more I realise I don’t know. As kids my parents used to drag my brother and I around the church yards of North Dorset. Other families went to the beach on the weekend! 😉 Not too sure what long lasting psychological effect that had on us but I can remember a shared and respectful fascination in piecing together generations of families, a sense of understanding the community – the lord of the manor, the farmers and the labourers. Lots of sadness in the infants and mothers who died during child birth and so often the shared graves of sons, brothers and fathers who died fighting in some far off country.